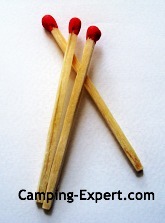 Waterproof Matches: Choosing the Best Firestarter! 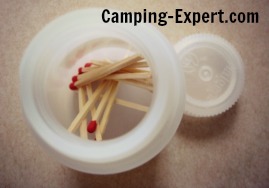 Waterproof Matches are vital to any camping trip. 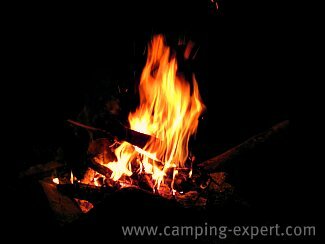 When camping or doing any outdoor activity, you want to be able to make a nice campfire at the end of the day, and the worse thing is to get the fire wood together and realize that your match or fire starter is broken, or wet. Believe me. I have learned. The hard way. Days from the nearest corner store. When you are lighting a match, hold the stick somewhere so that it won’t snap when you apply pressure against the paper. Then, move your fingers once its lit. Keep in mind that if the match head is pointing down, the match will burn faster as the flames will move up the stick faster. What do I bring now? I Bring SEVERAL fire starting options on everytrip. This is something where back-up is important. Each is only small, and light, so it won’t weigh you down either. · A Magnesium Fire starter (this has saved me, so even if you think you’ll never use it. Bring it if you plan to be hours from civilization). · A Small Nalgene jar with strike anywhere matches (with a red AND white tip) and a piece of the strike paper (if not strike-anywhere- Red tip Only). The lighter is good, however if it gets wet, or runs out of fuel, it may not start. It is mechanical, and can break. The Nalgene jar with strike anywhere matches is better than standard waterproof matches since matches are waterproofed by wax and the water can seep through the wood or the wood sticks can get wet and then not light. By keeping them in a Nalgene, you know they will stay dry. Strike anywhere matches are important so if you forget the strike paper, you can strike these matches on anything! Magnesium fire starter is great because even if it gets wet, it will still make a spark and will work. A great back-up that doesn’t break and isn’t affected by water. 1. Matchstick packets – These are your typical cardboard tipped matches that you can often get for free at hotels as an advertisement, or corner stores for less than a dollar. In a pinch, these are decent, but not the best. The best way to light them, is to fold the cover backwards, so that the firestarter sandy bit is between the cover. Then put the match between the firestarter cover and pull while pinching the cover and firstarter. The match will immerge lit, and the cardboard won’t be broken. 2. Matchstick Boxes – these are higher quality matches made with wood. Coming in 3 kinds. a. Waterproof Matches – these are made by dipping the tip in wax. You can do this yourself with any match. However the wood can still get soaked, making it hard to light. Plus the wax coating makes it harder to strike. These waterproof matches are ok. But, I prefer non-waterproof matches kept in a waterproof container such as a very small Nalgene bottle. b. Non-Waterproof – These matches are great. They strike and light easily if they are dry, however if they are wet, they are useless. Keep them in a small Nalgene bottle (you can get very small ones that hold matches perfectly). Remember to bring the striker part of the box though, or they are useless. c. Strike anywhere – Are like the non- waterproof matches , however they have a small white tip on top of the red or green strike part. This means you can strike them against nearly everything- from rocks (my preference), to trees, to zippers and even teeth. These are my match of preference. d. Non-Strike anywhere – have only a one colour tip with no white bit (like the picture on the left). 3. Long Matches – Matches can come in Many lengths- often longer matches are made for longer burning time and for BBQ lighting when you need to get further to the ignition source. Another option is to use a skinny long stick and light the end. This also works. 4. Lighter (childproof or not) – lighters are great to have to light fires. They are quite resistant to water, although they can flood. Theirs problem is that they have mechanical parts which can break. They run out of fuel. Most made these days are child proof, which really means that they are adult proof as children will fiddle with something till they get it. This just means we now have more difficult lighters. I like to bring one or two, stashed in different compartments in my pack so that if one doesn’t work, I have another. 5. Fancy lighter – these lighters are much more resistant to mechanical breakdown and often can be re-filled when they run out of fuel. But they are heavier and more costly. 6. BBQ Lighter - these lighters are great for reaching to far places with fire. 7. Magnesium Firestarter - These are excellent back-up firestarters. How they work. Essentially you have a block of magnesium and flint. You scrape shavings of magnesium (with a knife) onto a small pile of very dry and light tinder- such as small wood shavings, dry pine needles, tiny twigs. Then, use the knife to strike against the flint part of the firestarter, which will make sparks. The magnesium has a 473 C (1883 F) ignition point and burns very hot , at 3100 C (5610 F), which will light the wood, and presto! Fire! :-D Now carefully build your fire around the flame. I have had to use this before, and was glad I had it. Now, maybe you can light the lighter, but need help getting the fire going. These may help you. 1. Giant matches - These are like matches on steroids. They are thick and longer, and burn with ferocity! This can help you to get your fire going easier. 2. Fire starter – There are many different firestarters, but one that is quite common is similar to a candle in a waxy ‘muffin cup’ with wood shavings. These will burn for quite a while, giving you a better start on your fire. If you need to know how to build a fire, then check out my page on how to build a campfire with your waterproof matches . Next time you can impress your friends with a rip-roaring fire! Since you’ve made it to the bottom of the page, I bet you never thought there was that much thought needed for a simple match or lighter!